Hillary Clinton plans to deal with the higher education bubble by massively inflating it. Her plan for dealing with the runaway rise of college tuition is to throw another $350 billion of taxpayers’ money into that bloated system, and her plan for dealing with the crushing burden of student debt is to make it easier to borrow money for college. It is typical of the old, unreformed “liberals” that they stare at a problem like the higher ed bubble, and instead of inquiring about its causes, they want to throw money at the symptoms. So let’s get to the causes. First, let’s define what the bubble is: an unsustainable year-over-year increase in college tuition, which has gone up by about seven and a half percent per year for the past few decades, increasing at a far greater rate than inflation and outstripping the ability of ordinary people to pay for it. It would be tempting to say that the result of this increase is a massive growth in student loans and federal grants. But that would reverse cause and effect. In fact, the increased availability of subsidized loans and federal aid is itself the primary cause of rising tuition. 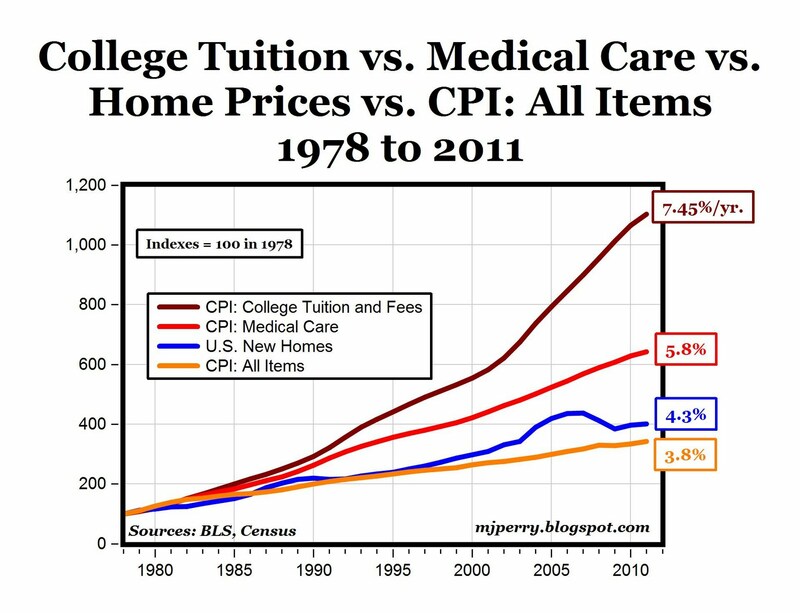 After all, the price of higher education can only keep rising if people somehow keep finding money to pay for it. And it is the loans and grants that provide most of that money. I have described this as the Paradox of Subsidies: “Why do you subsidize something? To make it cheaper. What is the actual effect? To make it more expensive.” As the government poured free money into higher education, the universities did what came naturally: they took more of that money, not less of it. They increased tuition to keep up with the increased subsidies. And they also decreased the amount of their own money they offered in tuition breaks and grants to students and instead took more of the government-subsidized money. We can measure the effect of subsidies: colleges pocket 65 cents of every dollar. We can actually measure the effect of higher ed subsidies. According to a study by the New York Fed, colleges pocket up to 65 cents of every increased dollar of subsidized student loans made available, slightly less for other kinds of aid. In effect, that money was “passed through” the students to the schools, who were its real beneficiaries. The most pernicious part of this is the massive expansion of student loans. Borrowed at subsidized interest rates and available to all students regardless of their field of study or academic record, government-backed student loans encouraged millions of young people to finance the higher education bubble out of their own future earnings. Government-backed loans encouraged millions of young people to finance the higher ed bubble. The worst impact is on those who were extended loans regardless of whether they were really prepared for college—students who were encouraged to spend several years of their lives and take on tens of thousands of dollars in debt, only to drop out before they earned their degrees. The second worst impact is on those who did get their degrees, but in subjects that have little economic value, like sociology or women’s studies. They were encouraged to borrow enormous sums of money against future income they are unlikely ever to earn. Those who received degrees with some conceivable commercial value are the best off, but they are still starting life in the hole, digging themselves out from under massive debt before they can save to buy cars or houses or start businesses. For millennials, who came of age under this system, it has stunted their independence and future prospects. All of this was backed by a cultural presumption, fanned by the universities and also by the very same political backers who were inflating the bubble, that higher education is an essential ingredient of the good life, a stepping stone to the middle class, and above all else a necessity for admission into genteel society—college education being the marker for America’s only true class divide. All of this increased the pressure on students to take out all those loans without reckoning how there were going to pay them back. The fundamental problem is the way subsidies have insulated higher education from all considerations of cost. It’s the old Platonic dream of the ivory tower: a system in which the academy is regarded as an end-in-itself, not to be held back by grubby market forces, and with the first claim on everybody’s resources. No wonder its cost has been spiraling out of control. The Clinton plan would take all the causes of the bubble and increase them. The Clinton plan would take all of these causes and increase them. It would pump $175 billion in new grants to be distributed by state governments, in exchange for a promise by state government to spend more of their own money on higher education, too. So that means more money pumped into the system to be soaked up. Her plan also involves expansion of a program that offers relief to borrowers, capping their student loan payments as a percentage of their post-graduation income and forgiving their debt after 20 years. All of which will encourage the sense that student loans are free money that nobody needs to worry about repaying. The only new things about her plan are that some of the costs of the higher education bubble will be collectivized, shifted away from individual borrowers to the taxpayer—which means that there will be even less connection between the value of a college education and its price. At the same time, now that the federal government is taking even more of the burden itself, it will make fitful efforts to clamp down on higher education by imposing controls and regulations. If Hillary’s proposal is a bit like ObamaCare for higher education, then like ObamaCare, it is really just a step on the way to a “single-payer” system. The higher ed bubble exists, and keeps getting bigger, for political reasons. What it is not is any kind of solution to the higher ed bubble. What we need is to remove subsidies, not to add them. We need to reconnect higher education back to economics and the marketplace, and to better align the value of a college degree with its costs. But that would be a political non-starter, because it would involve taking away subsidies from an interest group that reliably supports Democrats, nor would it offer handouts to buy the votes of young people who might otherwise be unenthusiastic about an elderly candidate. So the Paradox of Subsidies is really just a subsidiary of the Law of Intended Consequences. The higher education bubble exists, and keeps getting bigger, for a reason. It’s just that the reason can’t be found in economics or in education, but in raw power politics.